Free Shipping Included! Sylvania SDVD1332 13.3-Inch Swivel Screen Portable DVD Player with USB/SD Card Reader (Certified Refurbished) by Sylvania at Home Entertainment Centers Online. MPN: SDVD1332. Hurry! Limited time offer. Offer valid only while supplies last. Are you looking for a Super Sized screen to watch all your favorite DVD and digital media? is 10-Inch just not enough?! You have found your match! Are you looking for a Super Sized screen to watch all your favorite DVD and digital media? is 10-Inch just not enough?! You have found your match! 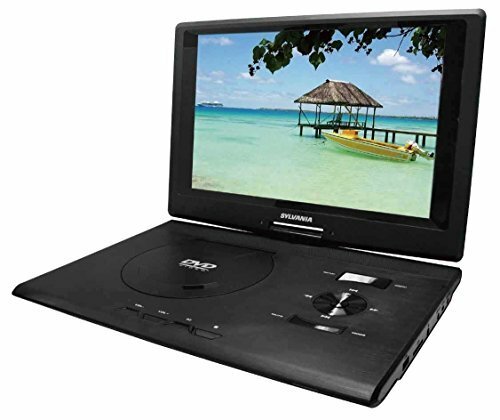 Sylvania's largest portable DVD Player is a must have! With a stunning 13.3-Inches clear and vivid display this DVD player will make you feel as if you are watching in a cinema. The DVD player swivels 180 degrees making it perfect for your home, car, plane or any place. No more children fighting over the machine, with this screen they can all see the movie clearly! the DVD Player includes a built in rechargeable battery, plus a car and home adaptor to make sure you never run out of juice. Also included is a USB and SD card reader - just plug in your digital media and enjoy them on this large screen! In the box you will find a full function remote control and ear-buds so you can sit back relax and begin your enjoyment. Sylvania is well knows for their outstanding quality and with this affordable price you are sure to have years of enjoyment! The power position must be turned to "off" in order for the unit to charge.